A lucky early cheap booking via SAS secured the journey itself as a steal, but due to their increased number of routes to keep up with the competition, they were still renting both aircraft and personnel. The route to Rome was at the time flown by Czech Airlines, as well as operated by personnel from there. This proved to be a very positive experience, something which would come in handy for the next trip, although it was not known at the time. They also served a meal on board (most international carriers do, it is a special treat from SAS not to get anything). The journey was in perfect weather, and the route over snow covered Alps and Dolomites was spectacular. By now, arriving and getting to the hotel was a walk in the park. Getting from the freezing conditions at Gardermoen Airport and to 20°C or so in Rome was almost like a summer heat shock. I have now stayed here twice, and must admit the second stay was a bit more disappointing. The hotel itself has a very good standard, but rooms are very small considering it is a Radisson SAS (where rooms always are very spacious). Even though it is purposely built in minimalistic style, it does feel a bit too minimalistic at times - such as where to put luggage, clothes etc - you will have to leave it in the way in your room. The rooms seem to have been changed somewhat as well - this time it really seems to be in favour of the minimalist exhibitionist, as the bathroom and shower is now more of an open solution. Last time there was a free surprise in the room when upgrading to one of superior standard, this time there was none. Breakfast is still great, but the selection was also somewhat reduced compared to last time. The location of the breakfast room is great though, with glass windows in all places. The fact that the air condition is not put into service at this time of year isn't a surprise, I have experienced this all other places in Italy as well and must be due to the fact that Italians freeze until temperatures exceed 30°C or so. With a minimalistic style hotel you will be hard pressed to find anywhere to sit comfortably, including your own room, and least of all in the reception area, which feels bad when you have to wait for the room to be ready for check-in. The best place of all to be is the wonderful terrace roof, sporting views of Termini (admittedly not the most attractive 'sight') but also other parts of the city (though no known monuments apart from the cupolas of the Santa Maria Cathedral). It was therefore a letdown to find this terrace off-limits to normal guests when they had arrangements there, which happened on two out of five evenings. The hotel location is far from superb - although it is conveniently located next to the Termini station and right beside the exit from the airport express train, with a Despar store located right inside. The order and cleanliness of the vicinity was even worse than last time - overfilled garbage bins smelling in the evening, as well as some parts obviously being used as toilets. It is better to head straight inside the Termini station and walk all the way underground to Piazza Cinquecento than walk along Via Giovanni Giolitti actually. Overall, should I return to Rome I might consider searching elsewhere. The obligatory first day, as it was a sunday and the Via Dei Fori Imperiali is closed to car traffic, includes a visit to the Colosseum. I must admit it almost made as great an impression as the first time - seeing it looming tall at the end of the street that leads you to it, no matter what direction you arrive from. It really is a marvellous piece of engineering, and although the interior wasn't visited this time, enjoying the exterior was still as much of an experience. The weather, temperature and temporarily pedestrianised version of the Via Dei Fori Imperiali had drawn a throng of tourists. Most of the rest of the afternoon was spent on this stroll from and to the hotel. I also had a search for a recommended Chinese restaurant from my Insight guidebook, but the place seemed to be very deserted and locked up. Instead, a refurbished version of the one preferred on the trip in 2006 was found to be more than adequate. The rule was set already - enjoy Chinese food for dinner, Italian food for lunch. The parallel street to the southwest of Via Giovanni Giolitti (running along the Stazione Termini) and the immediate area around seems to be teeming with cloth shops run by Chinese, and it almost feels like a 'little China' around here, apart from the fact that customers seem to be virtually nonexistent. It makes one wonder how they survive running all these shops. After having read several comments and discussion threads about visiting the Vatican (the museum in particular) and how to time it well enough to avoid endless queues, the following order was set up: Metro line A to the Ottaviano - San Pietro station, then visit St Peter's square and cathedral, followed by lunch, then the Vatican museum. On the last visit, as it was a wednesday, the new Pope had been performing his weekly performance for the crowds on Piazza San Pietro, thus the cathedral itself had been off-limits. This time it was open for visitors however, and there were of course lots of people around, although not too many. When viewed from the Piazza, the cathedral itself is nearly dwarfed by all the other huge buildings around, and the cupola which is at the far end of the 218-metre long main axis doesn't seem all too impressive. But when you squint to catch a glimpse of the people on the balcony, you get an idea of the dimensions of the structure. 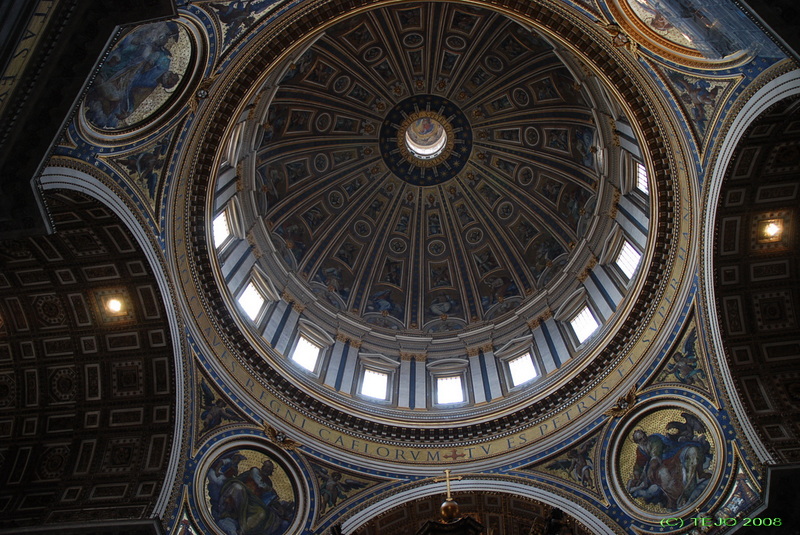 The same thing struck me upon entering the building itself - it seemed no bigger than several other cathedrals previously visited, but once you do the full circle and watch the cupola from below as well as the crossing axis, the experience changes. 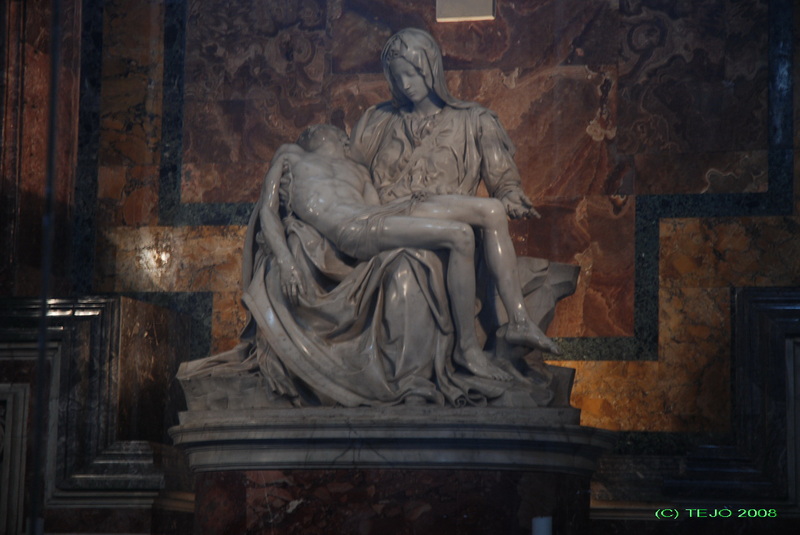 A sight not to be missed is of course the marvellous Pieta which Michelangelo made as a 25-year old in 1499, and sits to the right of the main entrance. It is sadly behind protective glass due to an earlier attempt at sabotaging the masterpiece. 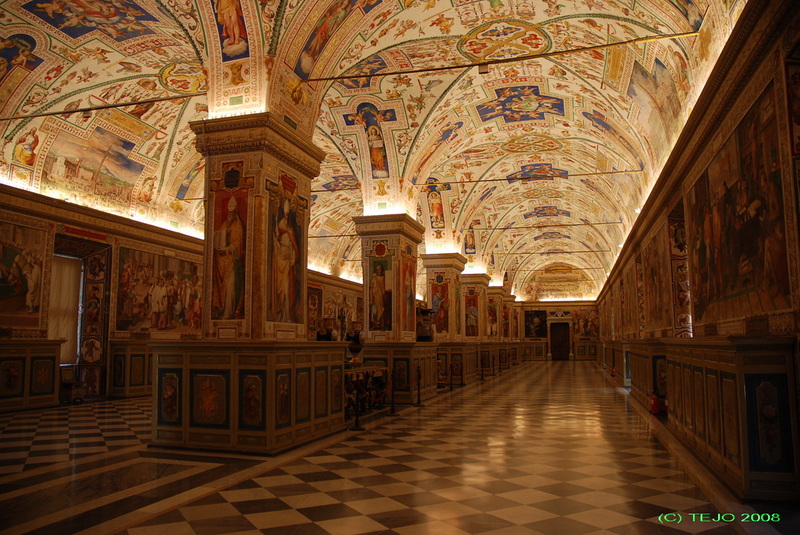 The cathedral itself is decorated with numerous frescoes and statues of various sanctimonial figures. The high altar which sits right below the cupola is an impressive structure in itself, and even though at this point the dimensions are felt, I believe the eye and perspective still plays tricks on you. There are different lines for entering the cathedral itself, the crypts, and the cupola. The latter was an attractive option, but was skipped due to the long lines. All along outside are signs reminding visitors to dress in a respectful manner, and this does indeed seem to be necessary. Lunch was enjoyed outdoors at a local restaurant just beside the main road leading towards the entrance of the Vatican museum. A good pizza and salad accompanied with a musician or two, hoping to get some cash off tourists for their involuntary listening to their serenades. The first steps in the direction of the entrance to the museum were of mixed excitement - how long would the queue be? Would it be a good choice to aim for an afternoon visit instead of what is usually recommended - coming as early as possible? And would the combination of this being the day after the monthly last-sunday-of-the-month-is-free-entrance affect the queues? As the last corner was rounded, a positive shock unfolded: the line was 10 metres long! And it took around 2 minutes to get inside the doors and just another couple of minutes to get past the ticket counter - the system was working quite efficiently. The entrance and ticket boots seemed to be of a fairly new date, so it has obviously increased the efficiency of easing the throng of tourists into the place. The entrance bit is quite a long one - a winding stair leads up to a large and pleasant courtyard, which seems to create a buffer zone for the crowds. I will admit straight away that most of the museums was just strolled along for the experience - not much was planned for here, apart from a couple of obvious attractions - the long hallway of the map room as well as the Sistine Chapel. And these two were indeed marvellous experiences. The map room was very crowded with people gaping at the incredible roof scenery, almost forgetting in the process to watch the actual maps on the walls (where was that famous map of Venezia??) The roof consists of not only frescoes and paintings, but even statues that seemingly blend into the frescoes as if they are part of them. 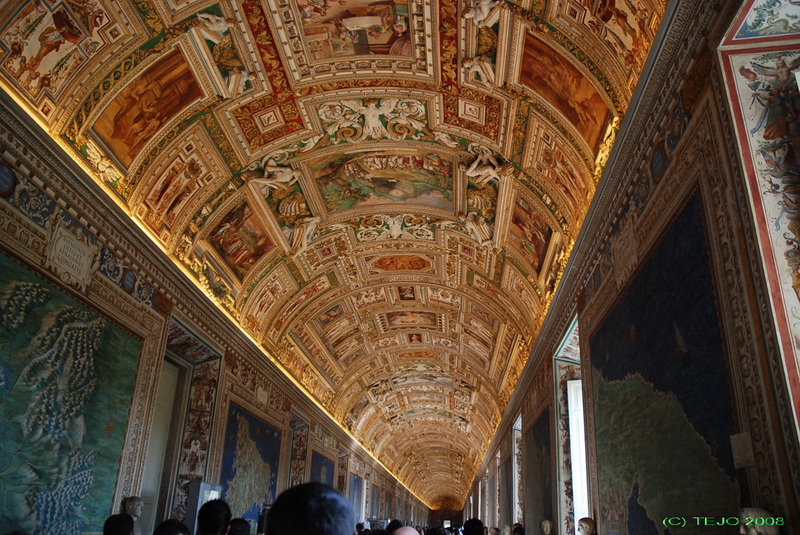 The crowd began to thicken as the final stairs towards the Sistine Chapel were reached. The chapel itself does indeed deserve every superlative that could be possibly said. One thing is describing it or seeing pictures or even a movie - but nothing compares to standing inside and marvelling at the wall paintings and of course the famous roof, which took Michelangelo four years to finish (and giving him slightly more than a sore back and neck in the process). Just go there - no further explanation will be made. There is a complete photo prohibit inside, and even though the few guards there did their best to both hush the crowds and prevent them from taking pictures, it seemed impossible to stop - people disregarded the prohibit en masse, and there was constant flashing everywhere. The prohibit is there for a reason, not for fun - flash photography will degrade the paintings over time due to the bright light it produces. Now imagine millions of flashes over the years...but tourists will sadly not be reflective enough to respect this - either that or they simply don't care. 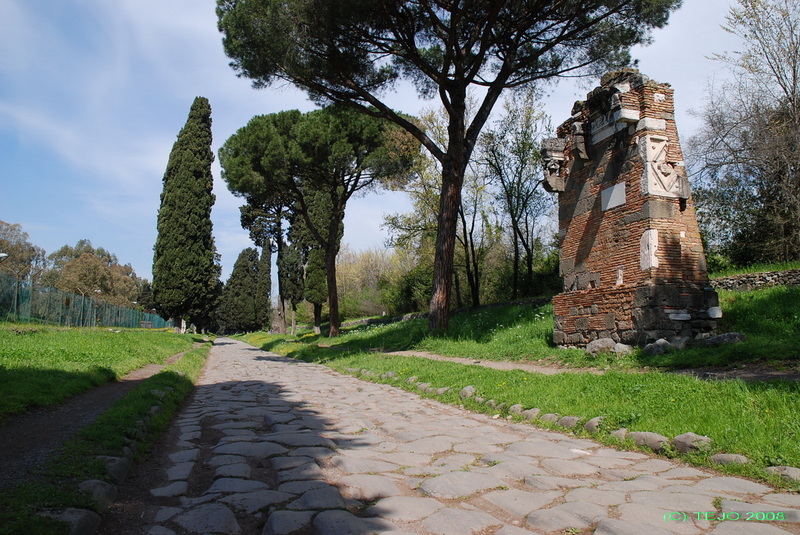 Even though this day would have been best to have right in the middle of the stay as a day away from the traffic and masses of tourists, the weather was so good that it was impossible to not go through with the plan of revisiting the Via Appia Antica. Last time, the hotel gave a description which ended up only at the Terme di Caracalla, which are impressive enough, but the aim was to walk along the ancient paved road itself, as well as visit the catacombs. So, the catacombs had been done, but there was no paved road like the one seen in brochures or pictures on the net. After a bit of further research, it was obvious that this was even further on compared to the last time. If hugely energetic, one can walk all the way out to the Ciampino area (Rome's second airport), but something in between, including the opportunity to return by bus without having to backtrack all the way would be the best thing. Time to do a little research..and a bit more...and even more...and finally, with the combination of the road and park areas' own home page http://www.parcoappiaantica.org - a fair bit of searching on a travel forum - and a detailed map of Rome's metro, suburb train and bus lines - and an idea had formed: Take the Metro line A towards Anagnina to 'Colle Albani - Parco Appia Antica', then switch to bus 660, which ends right at the ancient (paved!) road near Tomba de Cecilia Metella. Walk straight southeast along the ancient road, cross the Via Erode Attico, then head off to the left at the intersection with Via Casal Rotundo until reaching Via Appia Nuova. From here, bus 664 goes back to the same metro station (I am not sure which direction has the nearest bus stop, as it was quite a walk in a northwesterly direction before the first was found). This route was tried, tested and proved to work out quite well, apart from having to snake along the Via Casal Rotundo for a few hundred metres without any sign of pavement, as well as a bit of a walk along the fairly heavily trafficked Via Appia Nuova. The road was part of the Roman empire's connection to the south of Italy, and construction was begun alread in 312 BC, so it is one of the oldest parts still visible. It was also along this road that the slave revolters of Spartacus were crucified as an example of the fate that awaited those who tried to cross the mighty Roman empire...the bottom line perhaps being that no empire or superpower lasts forever. The Forum Romanum was not visited last time - a crime punishable by crusifiction, some might say, but this time it would all be remedied since the penalty had luckily enough been postponed for more than two years. It was another day with good weather, and the stroll back and forth through the ruins, searching for where this and that path lead to, took quite some time, as did searching for and composing good photo motifs. This was the very centre of the Roman empire - the high seat of the council, where endless debates took place, and life and death was decided with little regrets either way. Still, the people (or even mobs) at that time were very powerful, and falling out of their favour might result in an untimely death..as the saying goes, it is not far from the Capitolium (the centre of the council) to the Tarpeian cliff (an execution place where people were simply thrown off the cliff) - this site was closed due to ongoing work, but seemed efficient enough as a death penalty site. One has to walk by the Piazza Venezia (and the not-too-loved typewriter monument to Victor Emmanuel II, the first king of Italy) to get to this site. There is also another interesting thing along the way, just between the Piazza and the staircase (designed by Michelangelo) - an old insula. Remembering the old expression from my computer game 'Caesar III', these were indeed the houses of the 'lower end class'. The final destination for the day so far turned out to be Circus Maximus, of which little remains - apart from it being a sort of a green park (but almost without trees), just a wide open space. However, imagine 2000 years back when there were 300.000 spectators cheering as the horse races went on...that is quite another thing. Ok, back to Termini for lunch at the Autogrill (memories of the place visiting along the Autostrada in 2004 came back), then out for a quick visit to the Piramide - which is actually a fairly small copy of a typical Egyptean pyramid, and even though it looks fairly new (refurbished perhaps?) it is in fact 2000 years old and a tomb as well - the Roman empire stretched on to cover Egypt as well during its heyday. The final task for the day was a quick trip to the Colosseum late in the evening for a hopefully good night shot. After a couple of tries and experimentation, the result turned out pretty good - I only noticed the scaffolding on the picture later, not when I was taking the picture itself. At this time of night, various sellers and hawkers litter the street and area around Colosseum - some sell camera tripods, others sell pure junk, such as as flashing glass engravings of the monuments. And some seem to have a problem understanding the word 'no'. At least my tripod was bigger than theirs - by a large margin! Police cars were situated at either end of the Via dei Fori Imperiali, which I believe was a good thing. Another beautiful day with a clear blue sky - the last day was spent touring various sights, starting with the Piazza Espagna (quickly done, the most interesting feature being a roast chestnut seller, but after seeing the price - 5 € for half a handful, it was given a miss). The Pantheon and Piazza Navona are always worth a visit for their picturesqueness. More pantomime figures..and then a small piece of a Roman ruin right in the middle of a side alley in between newer houses - Rome does not cease to surprise. This time, a visit was paid to the ancient site of Largo di Torre Argentina - Area Sacra, one of the oldest ruins in the entire city. Here, four temples have been dug out in the early 20th century, and have just been named temples A, B, C and D, as it is not known for certain (Wikipedia has suggestions) which deities they were built to. The area itself, the oldest parts being around 2400 years old, is all that remains of a much larger area, shown on an information board at the site, and is also just a few metres away from where Julius Caesar was assassinated. It is also a cat shelter for homeless cats, and has grown in interest with both tourists and locals alike. A tour is given for free by volunteers catering for the cats, although they do hope for donations, as they do not receive any government funding. Lunch was enjoyed very close to the Fontana di Trevi, and on a side street somewhere (don't remember quite) - more gelato...mmmmm! In the late afternoon, the weather took a dramatic turn. A cold wind blew through the streets, and the temperature dropped by nearly 10°C. I remember hearing someone exclaiming 'é frio!' just outside the Termini station - 'it's cold!'. 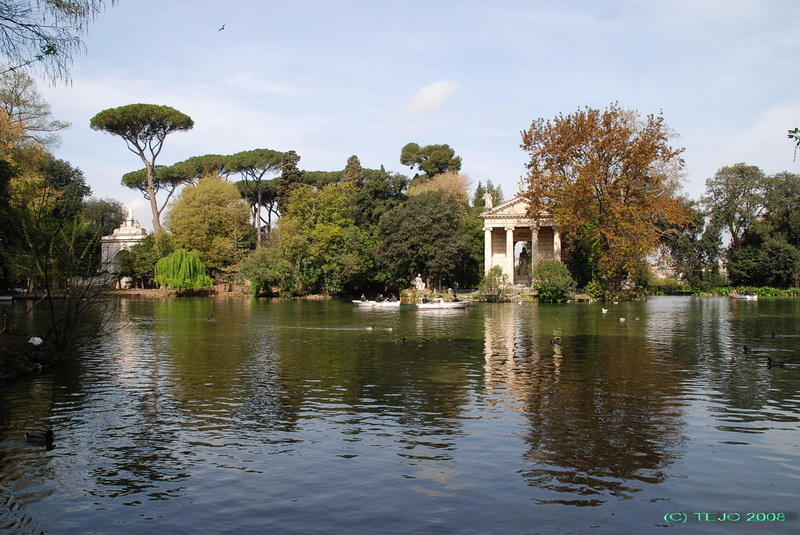 It is quite obvious that Rome is an amazing city to visit, and has a lot to offer, and the sheer amount of sightseeing might be too much to take in at one time. Therefore, many people return here, still without throwing a coin into the Fontana di Trevi. The metro works quite well, and is a cheap way to get around, however even though a third line is being built (if it ever will be finished due to stumbling over areas of archeologic value all the time), some areas have to be reached by bus for example. Getting around here by bus might be confusing, and the one covering the Via Appia Antica (Geobus) is highly unreliable, as was noted last time. Therefore, careful research is needed, as you will not always get a good itinerary from your hotel either when visiting such fairly remote destinations as the actual paved parts of the Via Appia Antica. Litter seems to become an increasing problem around - it looked worse this time compared to only two years ago, so something definitely needs to be improved here. Also, beggars seem to be abundant - from people boarding the metro line and shouting out something in italian which is probably 'poor poor me' or an equivalent, to gypsies openly breastfeeding right outside the main entrance to the Termini station (not exactly Mrs-nice-shapes-of-the-year either).